Fabio Herrera Martinez was born in San Jose, Costa Rica, and studied at the Faculty of Fine Arts School of Arts at the University of Costa Rica. Fabio took courses in lithography at the University of Guanajuato Mexico in 1976, and studied graphic design at the Massana School in Barcelona in 1976 and l977. 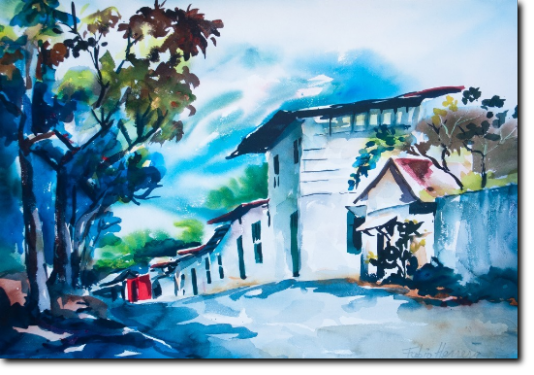 won the gold medal in watercolor and first prizes in competitions of rural landscapes in Costa Rica from 1972 to 1974. Other awards: National Engraving Prize-Serigrafia 1991 Costa Rica; Honorable Mention in the International Biennial of Engraving in Taiwan the same year as second in the biennial Peru; National Awards for Painting in Costa Rica in 1996 and in 2001 with the Group Bocaracá of Costa Rica. Collectively he has exhibited in London. Paris. Madrid, Mexico. Tokio. Santiago. Barcelona, New York. Washington. San Jose. San Juan, Chicago. Miami, Los Angeles, just to name a few. Exhibitions include: Art Museum in 1996, Costa Rica, Gesture and Sign Material: A Child's View. Joan Prats Gallery New York 1997; 2006 Galeria Alternativa Ventramas Costa Rica. He has published books about his work in silkscreen, drawings, prints and paintings. He has done performances. videos, and artistic creation. Many exhibitions in and out of Costa Rica were summed up in an exhibition in the Alternative Gallery, Located in San Jose, Costa Rica in May 2010. Landings Magazine writes about Fabio Herrera here. Read about Fabio Herrera in A.M. Costa Rica. Read about Fabio Herrera in La Nacion, Ancora. See his new exhibit, "Colors of the Earth," at the Daniel Oduber Airport in Liberia, Costa Rica.